WENATCHEE — When Patty Cone broke three bones in her left foot in 2011 in a freak kayaking accident, her physician told her to begin thinking of other recreational pursuits. Not so much the sport of paddling but rather another recreational passion of hers. Running. 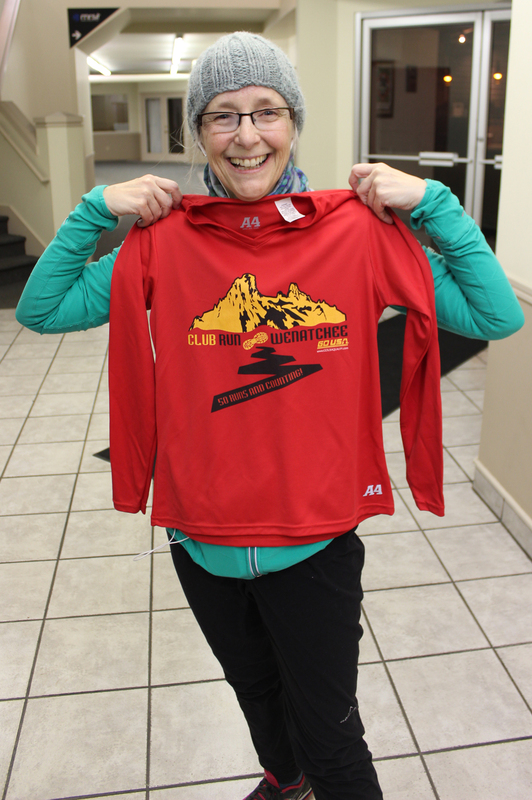 Patty Cone holds up her 50-run shirt at RunWenatchee's weekly club run on Feb. 6, 2014. Cone followed her doctor’s orders and gave up the sport for more than a year following the injury. But the “running bug” never really left. On Jan. 3, 2013, determined to get back into the activity, she was one of 45 people to take part in RunWenatchee’s first-ever club run on a chilly winter night. It took her a long time to travel the 5 kilometers on the Apple Capital Loop Trail but she finished. The next week she was back. A spark had been lit. On Thursday night, 13 months later, the Wenatchee teacher became the first club run participant to claim a “50-run shirt,” awarded to those who complete 50 of the Thursday runs and/or walks. To put that accomplishment into better perspective, there have been 56 weekly club runs since that January 2013 start, and 1,033 people have participated in at least one jaunt. Of that overall number, 265 have been awarded 10-run shirts and 39 have received 25-run shirts. As she accepted the 50-run shirt from coordinator Kit Cammack, Cone was jubilant, if not cold after braving 15-degree weather. She also thought back to that day in 2011 when she rolled her ankle while unloading a kayak on the banks of the Columbia River at Orondo. Initially thinking the foot wasn’t broken, she continued on that day and finished the paddle to Lincoln Rock State Park. 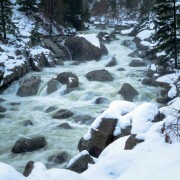 But the foot ached badly and she hung her foot out of the boat and in the water as she maneuvered down river. In addition to receiving the 50-run shirt, Cone also will be the first to have her name engraved on an official club run plaque. 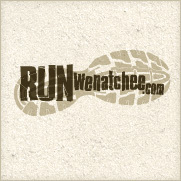 The plaque will be on display at each weekly run as well as at RunWenatchee’s official races, such as River Run and the Lake Chelan Marathon. Another runner, Rachel Findlay, is expected to be the second person to hit the 50-run plateau and get her name engraved. Findlay completed her 49th run on Thursday night. It was Cammack’s idea for the plaque. She considers it a visible way to honor those who accomplish such a high mark. “That way people see it frequently and have it remind them they still have a goal,” Cammack said.